The CS-DC international network of scientists is in charge of constructing the challenges of the living roadmap and producing/sharing the research and educational resources for dealing with these challenges. 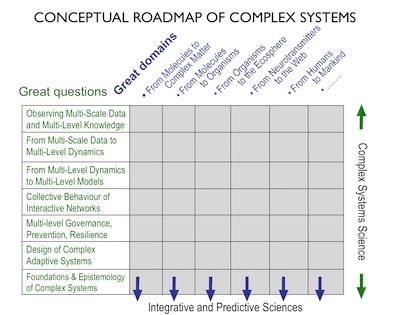 The living roadmap of complex systems is under peer to peer interaction with the whole scientific community on the CS-DC Wikiversity portal. starting with a great transversal question and looking to the responses through the main classes of multi-level complex systems. All together, their scientific challenges constitute the international living roadmap of the complex systems science, as a transdiscipline. starting with a main class of multi-level complex systems and looking to the responses to the great transversal questions. The result constitutes the living roadmap of an integrative and predictive science, as a transdiscipline. These two dual scientific strategies are producing two equivalent roadmaps, because its horizontal chapters and is vertical chapter are covering exactly the same matrix of scientific challenges. By construction, the CS-DC organisation has almost exactly the same structure as the living roadmap: the e-departments correspond to the chapters; the e-laboratories and project-teams are covering in a more and more precise and complete way the matrix. Their new results from research and education by research are shared as CS-DC resources for overcoming new challenges. The permanent transdiciplinary interactions in the matrix increase the natural convergence between the theoretical aspects of the living international roadmap of complex systems and the experimental aspects of the living international roadmaps of the new integrative science. This "natural convergence" is of the same kind as the reciprocal co-evolution of mathematics and physics in the last centuries.